Even before voters headed to the polls, Egyptian President Abdel Fattah el-Sissi's win was pretty much guaranteed. Abdel Fattah el-Sissi won re-election as Egypt's president in a landslide. 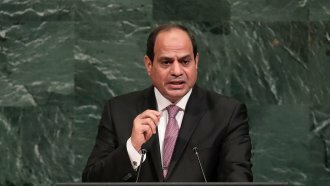 Egypt's state-run newspaper reported the preliminary results show Sissi won more than 90 percent of the vote. The three-day election concluded Wednesday. Even though some voters said they were paid to go to the polls, turnout was reportedly not very high — just around 40 percent. As Newsy previously reported, Sissi's win was practically a foregone conclusion. Since several potential rival candidates were sidelined leading up to the election, Sissi's only actual challenger on the ballot was one of his supporters.